Klout measures influence on just about every important social network -- but it didn't include Google+ until today, five days after Google released the Google+ API. While getting added to other's circles won't increase your Klout score, +1s and comments on your posts will boost it. Add your Google+ account to Klout from the dashboard here. 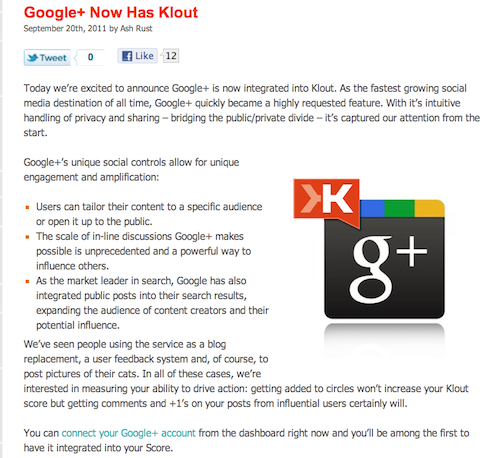 Klout said in July it needed access to the Google+ API before it could add the social network to the Klout network. Klout, which recently rated 100M people, has been criticized by some for incorporating data and rating profiles of users who have not registered to use Klout [ see our story here ].